We have 2 new Mo Wing Mondays events to tell you about. Be sure to put these on your calendar and if you are in either of these areas on June 15, please stop by. This is our first time visiting the shores of Puget Sound and we are looking forward to being in your great city. 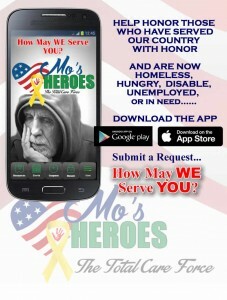 Mo’s Heroes’ mission is to assist our homeless Veterans across the country reintegrate into meaningful employment and become productive members of our communities. Visit Buffalo Wild Wings at 4219 S. Steele in Tacoma Mall on Monday, June 15 and tell your server you are a Mo’s Heroes supporter. BWW will donate 10% of your bill, drinks included, to support our ongoing efforts to help homeless Veterans. Mo Wing Mondays is BACK in Pearl City! Thanks to the tremendous support Mo’s Heroes received from the community the last time we were here, we have scheduled another Mo Wing Mondays at the Buffalo Wild Wings location at 1000 Kamehameha #227, Pearl City, HI. Mention you’re with Mo’s Heroes and BWW will donate 10% of your bill, drinks included, to help us help homeless Veterans across the country.